There is a great example of htmlwidgets in the Interactive Parallel Coordinates. You can interactively manipulate the Parallel Coordinates Plot to zoom in on interesting observations. 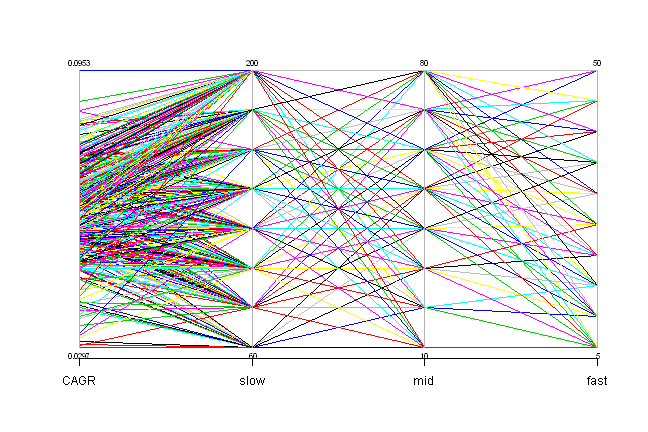 Sometime ago, I was reading about Visualizing system parameter optimization results at Visualizing Data. The article was using XDat app to create and manipulate back-test results.The idea is to run multiple back tests by varying system parameters, and display results using Parallel Coordinates plot. A great example of system parameter optimization is described at How to optimize trading system. The article presents a 3 dimensional plot with one parameter on X axis, one parameter on Y axis, and CAGR on the Z axis. This is a very good approach if you only optimize two parameters, but what to do if you have more than two parameters? The Parallel Coordinates come to the rescue. 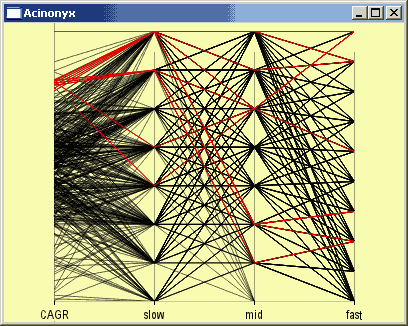 Let’s say we run a system parameter optimization, varying 3 parameters and stored results in the data matrix. The first column will contain CAGR and columns 2:4 will contain parameters values. It is quite hard to navigate this plot. Ideally, you would want to select a ranges for parameters and check corresponding system CAGRs, or alternatively select a range of CAGRs and see what parameters produced them. The amazing Acinonyx - iPlots eXtreme package allows this Interactivity. Another way is to achieve this interactive behaviour is to use a great example of htmlwidgets in the Interactive Parallel Coordinates.